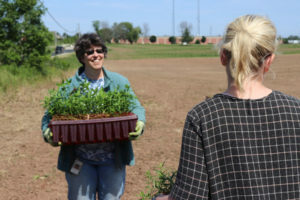 As part of its commitment to the City of Port Washington’s Mayor’s Monarch Pledge, Kleen Test Products (KTP) employees installed a restored prairie on a former farm parcel at KTP’s corporate headquarters. KTP’s Monarch Pledge project, which took 3 weeks, was prompted by employees who actively serve on Port Washington’s Environmental Planning Committee. The Mayor’s Monarch Pledge is part of an initiative set forth by the National Wildlife Foundation to engage cities, towns, counties and communities to join the effort to help save the Monarch butterfly. These efforts include creating inviting habitats for monarch butterflies and educating citizens on how they can help. Port Washington”s Mayor, Tom Mlada, joined the movement in 2017. Installing the restored prairie is only the beginning of this sustainability effort for KTP. The eleven acres of land will continue to undergo restoration for the next three years. Restoration efforts will include seeding with a mixture of grasses and forbs and hand planting milkweed throughout the parcel. The Prairie will also provide educational opportunities for KTP employees and the community. KTP encourages employees to participate in community sustainability efforts and the Mayor’s Monarch Pledge is just one of these programs. KTP is also a member of the Alliance for the Great Lakes Adopt-a-Beach™ program and their team maintains a stretch of beach along the shores of Lake Michigan.